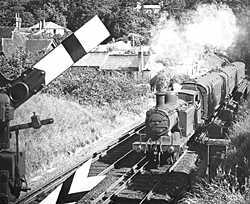 The LBSCR line did not run all the way into Guildford, but joined the Portsmouth line at Peasmarsh Junction, for the last few miles. Guildford is still a thriving commuter town, with a very busy station. 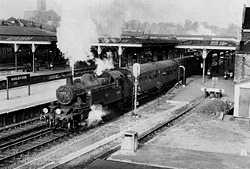 1) Platforms 2 & 3 in the late 1800's didn't even have a footbridge. 2) By 1986, the Victorian station was looking very shabby! 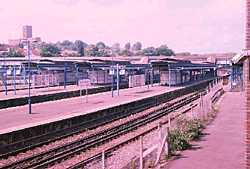 3) Redevelopment in 1987 tidied the station up greatly. 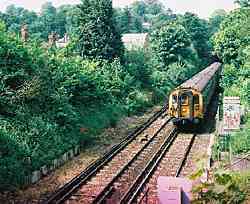 Before reaching Peasmarsh Junction, trains go through the two tunnels at St. Catherine's Hill. These pictures show the short gap between the two tunnels. The new light signals, which replaced the two semaphores, are just visible in the lower right corner.